The availability and ease of access to credit always changes with the markets. Certainly the current downturn in the farm economy has caused lenders to take a harder look at loans. Low milk prices have had a negative impact on producer cash flow, while limited processor capacity has slowed down herd expansions. Fortunately, there is room for loans that improve the efficiency of the dairy, but even those are harder to come by. Still, producers need operating credit to be able to purchase inputs that are essential to running the farm and dairy. Those inputs include crop inputs, like corn seed. This year if you are looking to spend more on corn seed, it might be more difficult to convince your lender to add more to the operating loan. Not all corn seed is created equal. But there are a few varieties that make exceptional corn silage that is easy to digest. 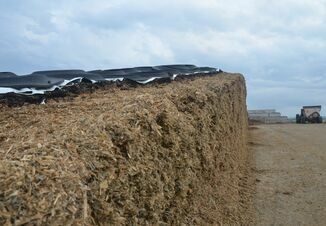 Corn silage options with highly digestible fiber, and even starch, are now available on the market. Digestible fiber leads to greater dry matter intake. 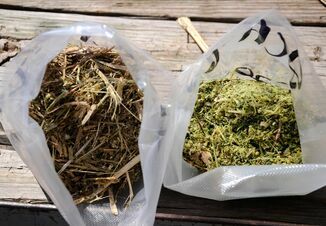 And, corn silage with digestible starch means more available energy, and energy from forages means less need for energy from more expensive feed sources. All this makes for more efficient milk production. Of course these silage varieties cost more than their high-yielding row crop brethren. 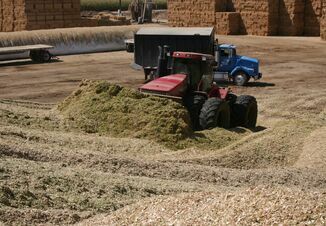 On average, silage quality varieties that carry the BMR trait, for example, can cost producers up to $100 per bag more than conventional varieties. Convincing dairy producers to pay more for these varieties is one thing. Getting their lenders to up the operating loan to cover the added seed costs can be a more difficult battle. Even if corn silage varieties like brown midrib (BMR) corn are a little more expensive, dairy producers see the advantages. Randall and Blake Holt, along with their family, operate a 5,000-cow dairy located in Hamilton, Utah. About two-thirds of the 3,000 acres of corn grown on their family’s operation is BMR. When they started the dairy in 2010 they planted BMR corn, and over time saw better yields. “We average about 30 tons per acre in our BMR fields,” Blake says. The greatest benefit of the BMR silage has been feed efficiency, Holt says. According to Jim Henry, dairy development manager with Mycogen Seeds, communicating the benefits of greater efficiency is “a riddle we try to go through every day.” The key, he says, is for the lender to see the benefits of not only greater efficiency but also a higher value silage product. The technology in corn silage varieties is just one technology that continues to evolve on dairy operations. That puts a strain on lenders who have to keep pace with understanding the benefits of advancing technology to make informed lending decisions. “It’s a challenge because technology changes so fast,” Davis says. Attending dairy industry meetings and trade shows is one way Davis and his team stay abreast of new information. Working in a large geography has its benefits as well, Davis says, with two or three projects going on at any given time there is an opportunity to see changes in the industry firsthand. “It’s important to just be out there and focused on learning new things,” he adds. In the end, Davis says understanding the advantages of new technology comes down to trust. For the Holt family, who started their dairy in 2010 in a difficult economic climate, working closely with their banker is second nature. Ideally the lender is part of the dairy’s advisory board, Davis says.